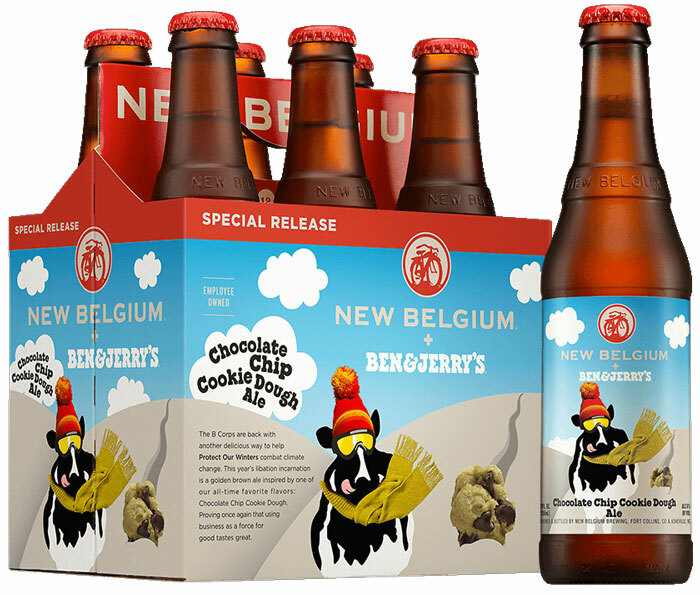 Ice cream and beer is an unlikely combination, but New Belgium Brewing and Ben & Jerry’s Ice Cream pull it off with their winter release of Chocolate Chip Cookie Dough Ale. They’re partnering with Protect our Winters (POW), an outdoor sports organization devoted to raising awareness for climate change. In addition to a portion of the beer’s proceeds being donated to POW, the three organizations are planning a series of rallies across the country with letter writing stations, POW athletes speaking out about the dangers of climate change, raffles, and of course beer and ice cream. Chocolate Chip Cookie Dough Ale is brewed with chocolate, vanilla, and brown sugar added to a Blonde Ale base. The resulting light golden brown ale suggests cookie dough in liquid form, without being heavy or syrupy sweet. It’s a tasty, refreshing way to support a good cause. This is a bit much. I like a lot of New Belgium’s beers but this is getting to be a but much. I like beer flavored beer. This just seems a rehash of the 90s micro explosion. Good craft beer needs to be focused on beer flavored beer, not fruit, deserts or cookies.